A quality baby bedding set is essential in making your nursery warm and inviting. All cotton tale patterns are made using the finest quality materials and are uniquely designed to create an elegant and sophisticated nursery. Tea party is a beautiful combination of soft vintage florals and rose faux fur. All fabrics in 100% cotton. The tea party 8 piece set includes 4 piece bedding set (4 sectional bumper, dust ruffle, crib sheet, and coverlet), diaper stacker, toy bag, pillow pack, and valance. Tea party 4 piece set is of a 4 sectioned bumper with 5" ruffle and floral ties, paisley sheet, a floral 18" dust ruffle in ocean blue, and a cream comforter in soft rose bud faux fur. The tea party toy bag is all vintage floral with a 5" ruffle trim, lined in paisley. Toy bags are great for storage of baby supplies or toys. Never tie on the crib. The tea party valance measures 18" x 68". 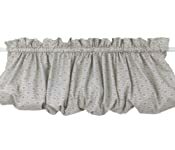 It is a balloon valance that can be stuffed for a fuller look. It is the ocean blue mini floral stripe fabric that is 100% cotton. 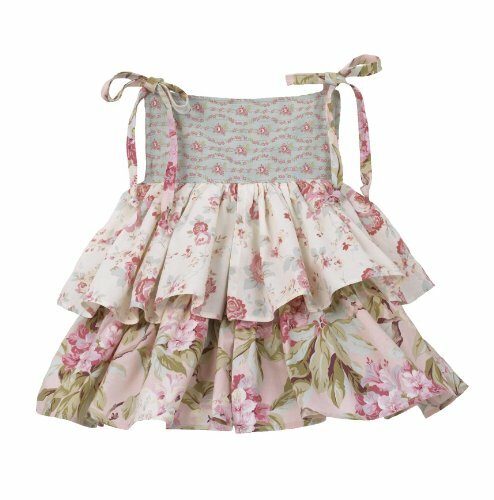 Tea party diaper stacker is made like a tiered ruffled dress. Adorable to look at and very functional. Holds up to 4 dozen newborn diapers. Can tie to changer or mounted on wall. Never tie diaper changer to crib. The tea party pillow pack has 3 stacked pillows, tied together with bias ties. Can be used together or separately. The pillows measure 15" x 15", 12" x 12" , and 10" x 10" with button. Pillows are a fun addition to the nursery decor but should never be used in the crib. Spot clean only. This beautiful pattern is sophisticated but soft and inviting. A perfect touch for your little girls nursery. Machine wash, cold water, delicate cycle, separate. Tumble dry low.